Image via WikipediaFacebook was in the news today but there was a real contrast in the stories that were digested by readers of blogs and news sources. 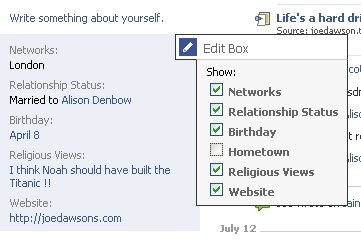 Firstly the continued improvements to the new Facebook received praise with the introduction of the News Feed Filters. Last week was the roll out of the Imports which were lacking when the site first migrated now it's the turn of the News Feed to receive an overhaul. The News Filters are a great addition and will likely become an addiction. With the extra tabbed headers we can cycle through the 'Top Stories' which is the traditional view that we are familiar with using and this will remain the default. Then there is Status Updates, I have really only used the Comment feature to respond to my friends status updates so this will be used heavily. I have shared other stories but these have been largely untouched so far with only really occasional interest shown from my friends. Then there are Photo's which display all the recently uploaded photo's/albums and finally Posted Items which are stories we submit. I import a lot of activity from other sites so I am hoping that they either expand on the Posted Items header or introduce the ability to add customisation. 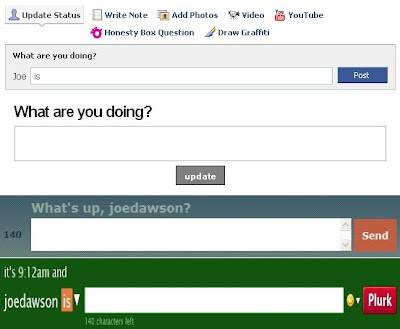 The developers are moving in the right direction and Facebook is slowly climbing up the lifestreaming ladder! The next story isn't associated with the site development it is a story that broke on the front page of all the evening newspapers. Not a particularly nice story either as a Facebook-organised water fight in Hyde Park ended up with violent scenes. Why are there always some that have to spoil it for the rest? From the photo's in the newspaper you see a girl approach a man and throw what looks like Cherryade in his direction. This hits him in the face and on his clothing and he chases after her with a menacing look on his face. He catches her and then strikes her in the face knocking her off of her feet and to the floor. Dozens of police then descended on the park and after cordoning off the area a stand-off between Police and the troublemakers took place before arrests were made. 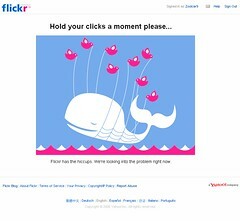 What should have been an enjoyable afternoon will be remembered for all the wrong reasons! No one can question the phenomenon that is High School Musical, it has proved to be a massively popular brand. If you haven't caught the hype then you have been lucky, it started as an infectious TV movie that provided unforgettable songs for the noughties generation. The quadruple-platinum soundtrack was last year's bestselling album, which speaks volumes about how highly regarded the franchise has become! My daughter absolutely adores the movies and is awaiting the third installment with a lot of anticipation. So how did the musical make the transition to the stage, very well as it was energetic and enjoyable. All the main characters were strong, I was really impressed with Sharpay as she came across well. The scene's with the basketball action worked well, I thought the final match was great where Troy scored the winner. Another stand out moment was when the character's were in detention with Eastender's Letitia Dean who played the drama teacher. They had to roll play and one of the pupil's acted out the role of a worm, crawling across the front of the stage. We laughed, cheered and sang along and definitely recommend this as a good night out! Image via WikipediaToday was expected to be quiet but how quickly everything can change, originally I was planning to go over to Bluewater to exchange some clothes for the children. That changed when I got a call from the children's Aunt to tell me that they wanted to come over to see me, in receiving the package the day took a twist! After going for the necessary shop we returned for lunch and then set about for an afternoon of playing Mario Kart on the Wii. I spoke to the Herne Bay one through various means but I don't think she fully appreciated us getting too engrossed with playing with the children's Wii. How random that still sounds even with the console being available for a long time now! After playing Wii until the children got fed up with my brother winning every race, we participated in some football in the garden. This ended up taking on many forms until they got tired and Boy decided that he would prefer to watch his Mermaid program. You go Boy! Their mother was having a barbecue and I was hoping for the courtesy Hamburger when dropping them off but it was wishful thinking as it didn't come. Afterwards I detoured to check out my brother's place which I will elaborate more on tomorrow and on to also crash out indoors. Feeling like I need to recharge my batteries now though so I am off to bed! Well at least I will try to sleep!! Today was a day to remember for the children, my daughter got her Pony Club membership through the post this morning and was really excited. Boy on the other hand was fully focused for Presentation Day at football and didn't disappoint. The first two matches he played he was strong and running around really challenging for the ball. After the break he wasn't as prolific as before but a boy on his team who regularly finds the back of the net made it a good mornings work for the green team. When the presentation came around all of the children were gathered together and the adults stood cheering as each name was called for the certificates. Then came the awards and as the coach listed what deserved the accolade of Team Player he mentioned that the winner was a person with a lot of character and a joy to train. Then he called out Boy's name and it was a good day at the office for him as he held his award aloft. Pony Club wasn't as I had expected as I thought that all the activity would take place on the main forecourt but as we arrived all of the girls were lead away to the stables. We waited for her return watching the older riders do the usual laps, I think he lost interest in my conversation and went off to play with a little girl. When my daughter eventually emerged from the stables to take the Pony's out to a nearby field she returned to us to detail what she had done. Informing us of the stable layout and how she would learn how to look after the Pony's. Judging by her membership booklet there is a lot of knowledge she can obtain from attending Pony Club. Both of them already looking forward to next week, with the summer holidays upon them now I'll have to try and arrange for them to participate during the week as well! Going through the process of a major clothing overhaul at the moment, I met up with my estranged partner and Baby to go shopping. We're Lily-Allen-and-Ed-Simons-ing FTW!! We nearly had a fail at the start as we didn't have a car seat but after rectifying this we were soon looking through the sales. The credit crunch has affected the stores so the sales are really generous, I have been making full use of ASOS and the offers on their site lately. They don't have children's clothing available there though which is a shame but if they were to start I would definitely use it. Instead H&M was the way this evening as this is where we got the most clothing for the kids. There was a large queue waiting to claim their place for the Dark Knight which made me jealous. I wanted to be there waiting with them to watch the movie! All the reviews have been very positive so I may be tempted to see it a couple of times on the big screen! Maybe it's not as extreme as that, if it is it's not reaching the usual news sources anyway. Another problem that doesn't appear to be widespread is 'ghost tweets' blogger Louis Gray had a Tweet he didn't write hit the service. Lets hope they can get this resolved as more people are losing patience and with alternative micro blogging sites they may wash their hands of Twitter completely soon! Came across an imported story on FriendFeed earlier about Pixar, the article from Rotten Tomatoes gave a glimpse into their working environment. 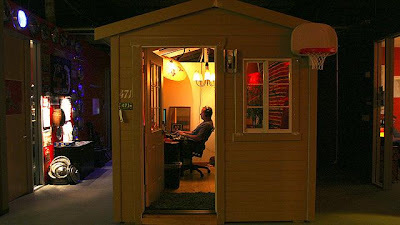 It looks like an amazing place to work, I really like the below image of the Garden Shed that one employee was working inside. I haven't managed to catch their latest movie Wall-E yet but I will definitely catch it soon with all the children. Maybe when we are away for the week as it would give us something to do one afternoon. The animation department are currently hard at work on Toy Story 3, Up which I expect will be equally as good. On the subject of Garden Shed's I am having my children stay over with me tonight as they have broken up from school and we have been playing Hide n Seek. I decided to give them a chance that I would count in the Shed before going looking for them, bad idea as they saw this as an opportunist moment! Away from the transfer speculation surrounding him, Christiano Ronaldo is currently in LA on holiday. The lifestyle of a 'slave' is very hard, I feel sorry for him, really I do as my summer holiday with the children to Leysdown puts his in the shade for sure. The press have been following him about as he continues his recuperation from his injury and one of the top stories this evening is his choice in clothing. I don't think he looks that bad, the orange skin maybe a stretch too far though! With Twhirl recently adding support for identi.ca it was only going to be a matter of time before the service was introduced to FriendFeed. That has now been added along with Plurk support bringing them both into our stream. This replaces the need for users who had been importing the RSS feed from the services so that these are now clearly defined. Those users using Ping.fm remember that updating multiple accounts now will see these duplicated through FriendFeed if you choose to import all of your micro-blogging sites! The last few days have seen a flurry of activity, but one thing is certain and that is I would be lost without the Internet. Always connected, online, updating blogs and status, talking to friends, sharing stories, listening to music and reading about the uncertainty in the blogosphere with the likes of Robert Scoble and Jason Calacanis. Maybe we take it for granted and too much good is having a negative affect! It probably is but without the Internet I wouldn't feel close to the people that matter. I also wouldn't be able to read about Chelsea's supposed bid for Kaka of £120 million or that Batman actor Christian Bale has had an altercation with members of his family. I can find out about these facts from the newspapers and television but online it's as it happens on blogs and through Twitter. I never really thought that many of my close friends followed my blog but they do which surprised me. If those of you reading this also have a blog, I would like to subscribe to read about your views so reply with your RSS or drop me a message on Facebook!! Spending a lot more time on Facebook these last few days, tonight after watching Knocked Up I have been trying out the Photo functionality and it works well. Don't be shy!!! I felt lost on the journey to my parents house as I am crashing there for the time being. Listening to my iPod and fumbling with my phone pondering what to do. We still have that connection where by what I think she does too and I received a sad face as a text message to which I responded with the same. There is a lot to talk about but we need to take time I feel and rediscover what brought us together in the first place. We all have aspirations of love, not being lonely, raising a family and living comfortably. I know only too well about losing what you have as I only see my children on Wednesday's and weekends. I write tonight with a heavy heart, lately my relationship has been going through a rocky patch and today the curtain finally came down. I would be lying if I said that I wasn't upset and there are a lot of factors involved that will all be affected. The children, the pair of us and the future now not looking so bright as it had done previously! Disagreement's over numerous issues, money, parenting and arguments which eventually have led to us going our separate ways. Is it a decision I like, not really but it is the right decision as we are divided on a lot of matters and the arguments aren't fair on us or the children. They are the most important aspect here, it's not fair them being involved. Our different views on parenting have often been a point of debate, we both have children from previous relationships so there is always another variable involved in the form of the biological parent. She took on a lot with me having two children but managed well considering the age gap between us and the interaction I have with the children's mother over their school and upbringing. I know I wasn't as accepting here as I don't approve of what I perceived to be trying to buy Baby's affection. This leads me to the title as children always want to grow up and be just like their parents and I am not doing too well at the moment. I have always tried to be fair with how I treated each of the children, referring to all three of them as my own when talking to anyone. I have experienced so much of Baby's life, all of the landmark occasions. Even her first word was Dad, why? Because when my children are around it's all they say, it's what she knows me as. Lately she has been a challenge but that's expected when a child reaches Baby 2.0, the development phase, the terrible two's! That has been an emotional strain lately because a lot of patience is required but also a level head as well because we needed to act in the best needs of Baby for instance when she is tired. It's going to be strange not being asked for a bottle first thing in the morning that's for sure! Image by ♠NiJoKeR♣ via FlickrI can't express enough how much I am looking forward to watching the Dark Knight, it's not that I know much about the plot or the ending. It's just that the movie is looking like it has all the makings of a classic. There has been all the talk of Heath Ledger's performance warranting a posthumous Oscar, the way that he totally immerses himself into the role of the Joker and portrays the character on a whole new level. Jack Nicholson in the 1989 movie was amazing but Ledger has raised the bar now! Today I finished work early to head over to pick up the children from school as their mother was attending a funeral. With it also being her birthday we wanted to get her something decent to take her mind off of things. Arrived at the school with my partner and Baby and the upside was that it was also a viewing day where we were able to check out the children's work in the main assembly hall. After collecting both children they showed us around their work and then we went on to the park. Not the best of recreational areas as there were some unruly children, one father letting his son relieve himself beside an apparatus underlined that I won't be returning anytime soon. 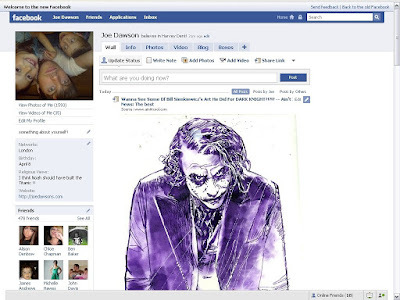 The long awaited Facebook profile redesign has seen a lot of delays but is now available for us to preview through a public beta. To access the updated profile, first log into Facebook and navigate to new.facebook.com and you will be redirected to your profile. I have encountered a few error messages and the developers are still tweaking the page format as when I logged in yesterday the profile picture was located down the right, today it has been repositioned to the left. Firstly you will notice that instead of the single page profile that it is now divided into Tabs which are located just under your name/status. 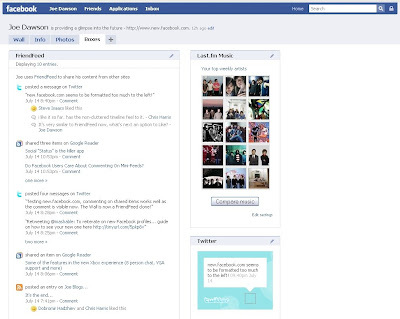 These are divided into Wall, Info, Photos, Boxes and there is a plus providing the ability to add more Tabs. The Wall/Mini Feed are the default view for your profile, although I believe for people who aren't your friends this is replaced by Info. 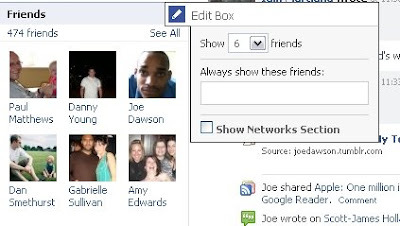 Editing the Friends Box allows you to now display more than the previous default, showing 6, 9 or 12 of your friends. You can also select to always show some friends and make the Network Section visible if you choose. Editing the Boxes is a welcome addition and is available for all of the profile boxes, this is still being worked on so what I mention could change in future but overall I am impressed with what is available. I really like the introduction of the tabbed profile browsing as it adds organisation to what can only be described as madness from my friends who add every application. The Info Tab provides Basic, Personal information and Education, selecting Edit Information at the top of the page enables you to edit everything and to finish select Done Editing. The Photo's Tab displays photo's of you and Albums which is an improvement. Boxes is where the Applications are located, I only have a few installed/visible so my Boxes Tab isn't too overwhelming when accessed. 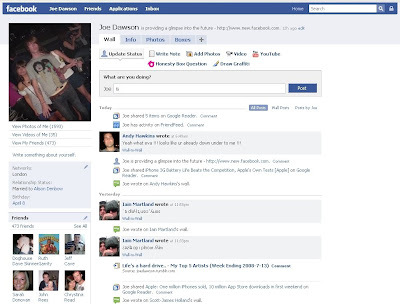 Clearly from the Facebook redesign the developers have imitated what is successful elsewhere. FriendFeed comparisons are obvious as combining the Wall/Mini-Feed and allowing comments on feeds is a definite nod to the FriendFeed development team. All that is missing is the ability to Like an activity/feed and you have a clone. It remains to be seen if this feature will be popular with the majority of Facebook users as so far my interaction with commenting on activity/feeds has been all one way as not one of my friends has commented on my items. Combining the Wall/Mini-Feed will make this more natural but still the issues remains about interaction and exposure! This could be addressed as like I said earlier this is still a work in progress!! Updating our social status is huge at the moment with many services available for us to micro-blog, activity update, create announcements etc. Facebook has offered a way for us to update our friends with what we are doing for a while, the profile redesign appears to be aiming to raise the profile of this. With Facebook this is an extra but updating our status has become a large part of our interaction with our Friends across other sites. I like how this has been pushed more but it's a pity that Facebook is in a sense a walled garden as surely making this available externally would be very popular. Everyone is aware of the problems with downtime and outages affecting other sites, I can't see that being an issue for Facebook! Overall I am really impressed with the direction the developers are taking Facebook, competition is healthy and leads to innovation. I am intrigued to see what the final build will offer and whether it will continue to offer more lifestreaming functionality. On the flip side once my friends are introduced to the new profile design I want to raise their awareness of FriendFeed which would be the obvious progression. Are my friends ready to embrace this new direction? 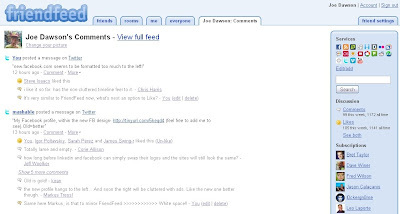 Do Facebook Users Care About Commenting On Mini-Feeds?